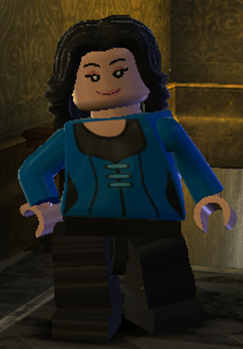 Hestia Jones appears in LEGO Harry Potter: Years 5-7. Her character token is found in The Leaky Cauldron, collected by jumping on a stool and being launched to the token. Heista Jones has long black hair. She has light nougat skin. She has curved black eyebrows over her black eyes. Heist a has nougat eyelids and white pupils. She wears nougat lipstick over her thin, black outlined mouth. Heista wears a bright blue jumper with low cut neckline. Underneath the neckline there's a large, medium grey, circular print.Theres three black lines coming down from the cemi-circle. The center line has three medium azure cylinder buttons at the top. The bottom sides of her torso are printed with black femine curves. Hestia's arms are bright blue, her hands are light nougat and her legs are black. Following the return of Lord Voldemort, Hestia Jones joined the group known as the Order of the Phoenix, a group of wizards sworn against the Dark Lord. She notably took part in the Advance Guard, safely transporting Harry Potter from his home to 12 Grimmauld Place. Also, prior to the Seconding Wizarding War, Daedalus Diggle and Hestia escorted the Dursleys to a safer location, hiding themselves and the muggle family from possible harassment or injury. This page was last edited on 12 January 2016, at 22:55.